Corrosion Control Systems • Protection for the Life of your building! Applied Thickness - Average installed thickness between 1"-2" or 75 to 300 times thicker than paint. Strength - Ultimate combination of spray polyurethane foam insulation and "fiberglass" resin coating technology. The final installed product is a structural composite assembly, having similar strength to products such as fiberglass tanks and piping. 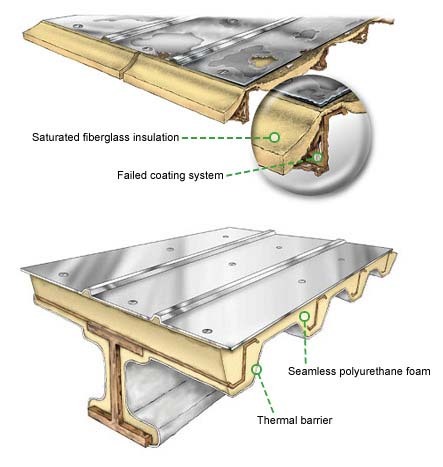 Low Permeability - High-solids, quick-cure system forms a tight cellular matrix that minimizes air, chemical and water vapor from reaching substrate. Minimal Surface Preparation - High-strength, low-weight system achieves mechanical lock to substrate, unlike traditional coatings that are solely dependent on surface adhesion. Copyright 2016 Corrosion Prevention Environmental Services Co. All Rights Reserved.